Halloween is fast approaching (as in 3 days from now!). The evening is full of spooky revelry for both kids and adults. In my neighborhood, after the kiddos are in bed and the masses have subsided, the adults get together for their own version of candy – wine & cocktails! This is a fun time to choose wines for their label, and we have some spooky – and delicious – picks. 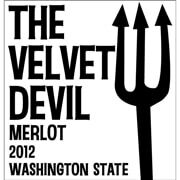 The Velvet Devil Merlot – with a pitch fork and everything! From eccentric winemaker, Charles Smith, this is a supple red from Washington State. Ghost Pines – The winery produces Chardonnay, Cabernet Sauvignon and a Red Blend. The wines are smooth and supple, with lots of ripe fruit. Concha y Toro Casillero del Diablo – “Cellar of the devil” – got to have these wines on hand for any Halloween festivities as they are great value and actually named for a haunted cellar! Razor’s Edge – Choose from Shiraz or Shiraz-Grenache. The label harks back to movies with Freddy Kruger or Jason from “Halloween.” What’s inside is that ripe Aussie fruit style – easy drinking and good for watching the kiddos go door-to-door.